Life... it can go from quiet to crazy in the blink of an eye... and I just happen to be in the crazy phase now. School for the kids and work for the grown-ups is part of the quiet. But add in after-school programs, piano lessons, Odyssey of the Mind, confirmation class and marching band (and all that goes with it) and that is where the crazy sneaks in. Those little squares on my October calendar are full of pencil marks... and November & December? Yes, they are starting to fill up, too. Taking a closer look, those marks represent the good stuff. The events and appointments that make us who we are, or help us on our way there. Once in a while, I have a chance to sit and do nothing... but if you call me and catch me during one of those times, I'm bound to ask Where are you? Am I supposed to be there? Love... Oh, love. What is not crazy about love? I am crazy in love with my husband... and if you mess with my kids I can go from calm to crazy in a flash. I'd be just plain old crazy without Jesus... and my love for my family leans towards crazy, too. Or maybe they are just crazy? Some of each, I think. But then there are some of the uncommon crazy-loves. Like ice cream and Sharpies... and Market Day chicken steaks. I guess I might go a little overboard... but as long as I'm loving, I may as well love with my whole heart! And if that means having a freezer full of chicken (12 boxes for the summer? )at all times, so be it. At least I know I have something to cook for dinner! So... maybe there is more than a little crazy mixed in. But when you are measuring crazy, you have to expect to go a little over the top! Hillary at the Other Mama wanted to talk crazy today... and she didn't want to be alone (that is no fun!) so I figured I'd share just a few crazy thoughts. I hope there won't be a vote on who is the craziest... because if it is me, I'd rather not know. You sound like my kind of friend. I love loud laughter and crazy love for family...most of all Jesus. Makes life interesting doesn't it? Hooray for the crazy. We have a lot of the crazy in our house. This is so funny Dawn. I love the: "Am I supposed to be somewhere" thought. I am not as busy as you anymore, but I still have this thought several times a day!!! Your laugh...oh how I love your laugh. Loud? Yeah, but who cares...this is how I find you in Target!!! I am still trying to embrace my laugh...loud, cackling..my kids don't care for it. I think one day they will miss it!!! Crazy? Yep, you have that too. Just one more thing to love about you!!! Came over from Hillary's. OK, 12 boxes of chicken-steaks (what is that exactly?) does sound a little crazy to me. 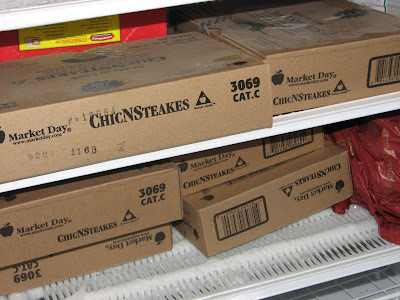 A freezer full of ChicNsteaks from Market day...not so crazy :) However, not having them put into freezer bags preseasoned and ready to toss into a slow cooker or on the grill for dinner in a dash...a little crazy by my standard :) Sorry... I'm a little crazy about filling the freezer with 4 meals in 4 minutes and when I see unseasoned chicken it brings out the crazy in me :) ! I have a distinctive laugh, too- or so people say. maybe a little anoying? I don't know- definitley not like Chandler's girlfriend on Friends- just loud. And I am all for filling a freezer!! I think we all have that crazy feeling of "I know I'm forgetting something"- at least I do every morning. I'm so glad you are participating, Dawn!! I think i could relate most to "am i supposed to be somehwhere." At 40 something i am having major memory lapses so i'm always in fear that i'm forgetting something really important! Beautiful blog design and music! Just want to say that you have some favs of mine on there...which makes me want to check out the others I don't know. Can I tell you that I've yet to tire of Unwritten? LOVE that song. Held is special to me too. and Cry Out to Jesus? Oh my. And Washed by the Water...makes me want to cry at God's goodness. So, props to your playlist, girl! I am the worst mother in america! Can you believe that I have never ever ordered anything from market day.... So, I guess you would reccomend the chicken steaks! Good to know!